100% pure, fresh meat for dogs; with natural prebiotic properties. Farm Food Fresh Menu contains only natural ingredients. All animal derived ingredients used in Farm Food Fresh Menu come from animals from the E.U. that are approved for human consumption. All added vitamins and mineral nutrients in Farm Food Fresh Menu are organic and suitable for human consumption. Farm Food Fresh Menu combines well with, or can be mixed successfully with Farm Food HE. Farm Food Fresh Menu is a complete food, so can be used as a daily meal. It is not necessarily meant to supplement Farm Food HE or any other food. 65 grams of Farm Food Fresh Menu equals 25 grams of Farm Food HE. Farm Food Fresh Menu is developed by our own nutritional team using our own unique recipes and expertise. 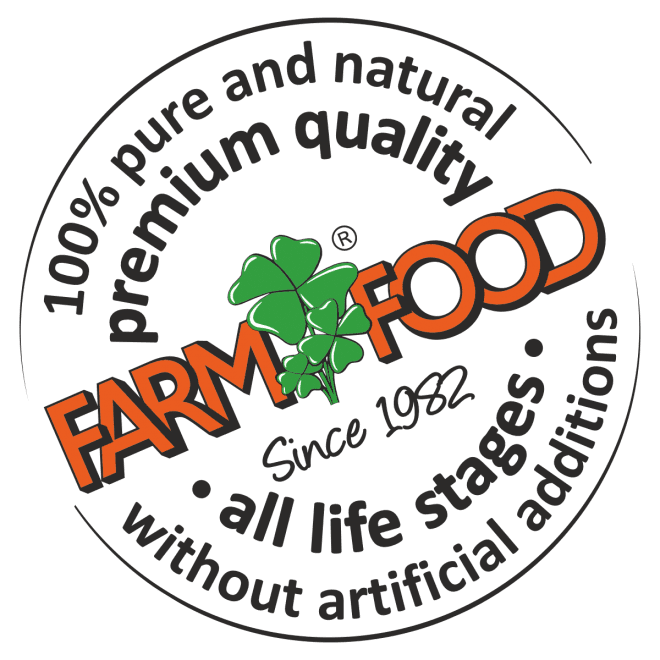 Farm Food Fresh Menu does not contain fillers or thickeners. This gives it a high caloric value relative to its volume. Farm Food Fresh Menu encourages highly stable intestinal bacteria for your dog. A healthy, well-established intestinal flora is the basis of good health. Farm Food Fresh Menu is a ready-made and complete, gently steamed fresh meat. It is therefore an excellent base or can be given in addition to your home-made dog food. You do not need a freezer or refrigerator to feed your dog complete fresh meat. Since Farm Food Fresh Menu comes in sizeable portions, you are saving a considerable amount of time during preparation (no snipping or cutting of meat required). Scottish Salmon oil and cold-pressed sunflower oil are added to Farm Food Fresh Menu for omega 3 and omega 6 fatty acids. Farm Food Fresh Menu does not contain chicken or other poultry products. Because most chicken (poultry) available comes from animals that have been slaughtered in their growth peak (chicks of 5-6 weeks old), their carcasses are high in natural growth hormones (produced in the chicken’s pituitary gland). In our experience, all factors combined have a negative effect on the overall health of dogs. Growth in young dogs and fertility in particular seem to be affected. When mature hens are used (slaughtered when they stop laying enough eggs) these effects are not as prominent or do not occur at all. Farm Food Fresh Menu does not contain omasum. Omasum has a nasty ‘floating’ quality. It reduces the amount of time the food remains in the intestines and the stool is slightly grey coloured (depending on the amount of omasum in the food). Omasum as a single food is often given when a colon cleansing is desired. Farm Food Fresh Menu does not contain organ meat, other than beef heart and beef liver. Although all intestines can be called organs, what we mean is that Farm Food Fresh Menu does not contain lungs, kidneys, pancreas, spleen and such. Farm Food Fresh Menu is 100% gluten free. To start the starch digestion capacity in pups, 2 percent of rice is added. Farm Food Fresh Menu does not contain bone. This guarantees a controlled calcium/phosphorus absorption. It is not known what the calcium/phosphorus absorption (usability) of (ground) bone for dogs is. When bones are mixed in with the meat, there is no way of knowing if the calcium/phosphorus absorption is sufficient, too much, or not enough. That is why we use inorganic calcium/phosphorus minerals as natural dietary supplements to achieve the right calcium/phosphorus amount and balance, because we know what their absorption in the dog’s intestines is. That is why Farm Food Fresh lends itself well for use as a base for, or in addition to your home-made dog meal. Why not add ground bone as a source of calcium/phosphorus? A large amount of phosphorus is from the meat itself and although ground bone, as a source of calcium, is financially attractive, we have chosen a mixture of inorganic calcium/phosphorus minerals in the interest of the life-long health of the dogs. This ensures the calcium/phosphorus balance in the food and absorption and, as a result, biological availability in accordance with the daily needs of both pups and full-grown dogs. The calcium/phosphorus balance in bone is always hard to determine, and even more so when the ground bone is included in the meal. There is a reason wolves do not chew/gnaw/eat the bones until the stomach is almost empty again. Wolves gnaw on bones after their meal and never during. To free calcium from bone, the pH level (degree of acidity) in the stomach has to be low to such an extent that the calcium in the bone can be dissolved by the gastric juice. Only then can the calcium (and the phosphorus) be absorbed in the intestinal canal and is it available for the metabolism. When there is a full meal in the stomach the pH level in the stomach is so high that calcium from bone dissolves either incompletely or not at all, making the availability of calcium and phosphorus from that source an uncertain factor. That is why we have chosen not to use ground bone in Farm Food; after all food is the main, daily recurring factor where the health of your dog is concerned. A Farm Food Rawhide bone or Farm Food Antler (made from naturally shed red deer Antlers) every now and then is fine, but only after the meal. Your pet store can now supply a Farm Food Fresh Menu storage container. It will easily hold 2 pouches of 300 gram Farm Food Fresh Menu. Because the container can be closed tight, it is easy to divide Farm Food Fresh Menu into portions for several meals a day.